Zodiacal And Calendar Months - The New Year - Hamal - The Passover - Gems Of Aries - Mars The Ruling Planet - Marbodeus Gallus - The Qualities Of The Diamond - Tavernier - The Regent - The Koh-I-Noor. THE Sun enters the Zodiacal House of Aries on March 21st of each year, and remains in occupation until April 20th, his entrance to this House marking the commencement of the Zodiacal year, with days and nights of equal length, and also signifying the advent of Spring. The Zodiac is an imaginary belt in the heavens which extends for several degrees on either side of the apparent path of the Sun, called the Ecliptic, which is divided into twelve sections of thirty degrees each, known as the Houses of the Zodiac; and it is in this belt that the planets move and form aspects. The Sun takes a year to travel through the twelve houses, remaining a month in each; the months are not, however, the familiar ones of the Calendar, but are for periods from the 21st of one Calendar month to the 20th of the next approximately. The time of the Sun's entry into Aries marks the Zodiacal beginning of the year, as from this time the days are longer than the nights, and are still increasing in length; the fact remains, however, that the First of January was fixed by Act of Parliament as the beginning of the New Year, although our law-makers in 1752, when re-forming the Calendar, would have been wiser and more accurate had they fixed the New Year at the Vernal Equinox instead of adopting the System of the Romans which was originally formed out of compliment to Julius Caesar. The Constellation Of Aries is situated in the Northern Celestial Hemisphere near the Pleiades, between the Constellations of Pisces and Taurus. In its group it has three very bright stars visible to the naked eye, the brightest of which is known as Hamal, or the Sheep, and was much more poetically described in the Akkadian tongue as "Dilkur," the dawn proclaimer. The Chinese have a tradition giving the greatest prominence to Aries from the fact that it was believed to have occupied the centre of the heavens at the Creation of the World, a belief that was also held by the Babylonians. 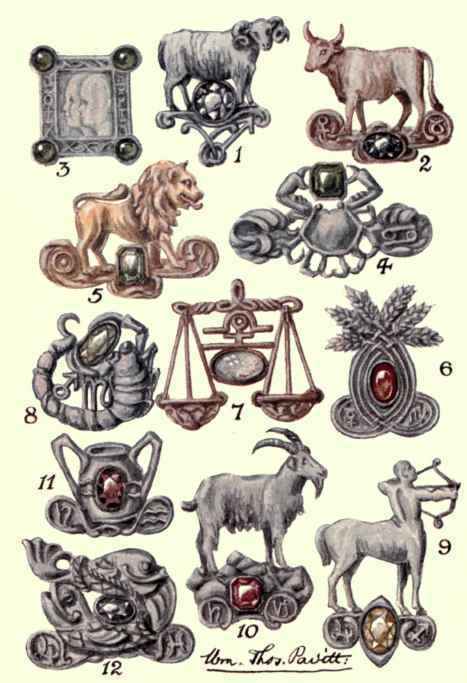 Gems, Symbols, And Glyphs Of The Zodiac. 1. Aries the Ram, Diamond, Iron. 2. Taurus the Bull, Sapphire, Copper. 3. Gemini the Twins, Agate, Silver. 4. Cancer the Crab, Emerald, Silver. 5. Leo the Lion, Chrysolite, Gold. 6. Virgo the Virgin, Cornelian, Silver. 7. Libra the Balance, Opal, Copper. 8. Scorpio the Scorpion, Aquamarine, Iron. 9. Sagittarius the Archer, Topaz, Tin. 10. Capricorn the Goat, Ruby, Lead. 11. Aquarius the Water-bearer, Garnet, Lead. 12. Pisces the Fishes, Amethyst, Tin. The Symbol of this House is the Ram (see Frontispiece, No. 1), which in the early religions was considered symbolic of sacrifice, and in connection with this may be noted the fact that the Jewish Passover was commenced in this sign when Moses was commanded to sacrifice a young Ram, a sacrifice which was the forecast of our Easter Services. Chemical evidence reveals the fact that the human body is composed of separate elements, common to all physical formations, and that the differences between individuals is caused by different and varying combinations of these elements, portions of which are vivified to a greater or lesser degree by the Planets of our Solar System. The influence of this force should be taken into account when the relative effect of one person's mind qualities, or magnetic emanations, on any other person is under consideration. Aries rules the Head and Face, and brain-workers are consequently typical of this sign, Reason being their ruler, and this the most positive of the twelve houses. Those born under the influence of Aries must be leaders, the brain being the most active part of their bodies. Having unbounded confidence in their own abilities when working out their plans, difficulties are scorned, or even welcomed, for they have the true Martian spirit - the love of conquest. Pioneers in thought and action, ever exploring and originating, they bring unflagging energy and fearlessness in emergency to their pursuits, seeming specially gifted by Nature to tread the thorny paths of life, making the ways smoother for their weaker brethren. Their methods must, however, be their own. If required to work on conventional lines they are never happy, and seldom successful; understanding what they require, they must be left to accomplish it according to their own ideas. Optimistic in regard to their enterprises, difficulties are underrated; but where any matter requires to be dealt with quickly and promptly, they are at their best. Aries People are very enthusiastic, brave, venturesome, generous, and impulsive, self-willed and opinionated, fond of change, romance, and adventure, ever ready to champion the cause of the weak and suffering, this tendency frequently leading them to acts of indiscriminate charity often wasted on undeserving subjects. They have great ideality, are highly strung, often hypersensitive, with remarkably keen perceptions in which they are rarely deceived. They are naturally ambitious, and often lacking in caution; but, as they are ruled by their reasoning powers, it is in this direction they are open to control and should find their Zodiacal and Planetary Stones of great benefit to them. In matters of business, friendship, and the affections this type will harmonise best with those between April 21st and May 21st, July 22nd and August 21st, also November 22nd and December 20th. The gems of this House are the Bloodstone and Diamond, which, as a rule, will not be good for people born between June 21st and July 21st, unless Mars was very favourable at their birth.